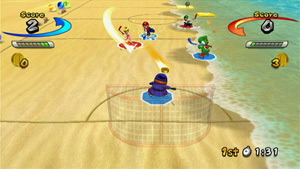 When a strange object crashes by Peach's Castle, Toad discovers four crystals inside, containing a basketball, dodgeball, hockey puck and volleyball. Toad	decides to set up tournaments for each game and invites all his friends to join. Up to four players can take part in small teams for each sport, playing together or competitively. Players have a range of power moves they can use in each sport to give them an advantage.